If you are selling your home by owner, you are the primary marketer of your home. One of the best ways to broaden your appeal these days is communicating through social media. Facebook is a great place to start. You probably already have a Facebook account, and it’s a place to instantly recruit your friends and family to help you get your message out. The keys are to post often about your home and to do it in interesting ways. Just posting a link to your home’s listing isn’t going to be as effective as posting a picture with a great caption and then the link. Even better, you can tag pictures and posts with your friend’s names. Tagging gets you more exposure because now their friends will see your posts in their news feeds too. For example, you could take a picture of your back deck, tag a few neighbors and say something like: “This deck is one of my favorite things about our home. Hey David, remember when we had that neighborhood cookout back here? Great community, great neighbors for whoever buys our home.” (Add a link to your home’s listing at end.) 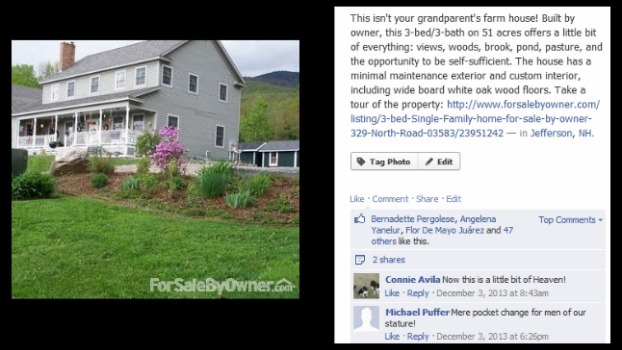 Now your friends and David’s friends know your house is for sale, and that it has a great deck and great neighbors. A tip: If you post regularly on Facebook about your home, be sure that your privacy settings are set to public on those posts. And always include a photo or video in your post plus a link to your home’s listing page. Carrie Richardson is Director of Client Development for South Oak Title, located in Birmingham, AL. Learn more about South Oak Title and the services it offers. This article has been republished for additional educational purposes. This article is not affiliated with any links or products that appear on the same pages. Read more about our editorial policy.